The antibody detects endogenous level of total PEPD protein. Recombinant protein of human PEPD. Small volumes of anti-PEPD antibody vial(s) may occasionally become entrapped in the seal of the product vial during shipment and storage. If necessary, briefly centrifuge the vial on a tabletop centrifuge to dislodge any liquid in the container`s cap. Certain products may require to ship with dry ice and additional dry ice fee may apply. This gene encodes a member of the peptidase family. The protein forms a homodimer that hydrolyzes dipeptides or tripeptides with C-terminal proline or hydroxyproline residues. The enzyme serves an important role in the recycling of proline, and may be rate limiting for the production of collagen. Mutations in this gene result in prolidase deficiency, which is characterized by the excretion of large amount of di- and tri-peptides containing proline. Multiple transcript variants encoding different isoforms have been found for this gene. 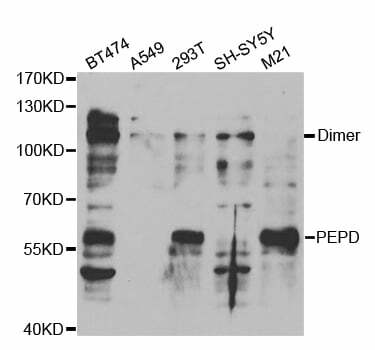 Western blot analysis of extracts of various cell lines, using PEPD antibody. NCBI/Uniprot data below describe general gene information for PEPD. It may not necessarily be applicable to this product. peptidase D: Splits dipeptides with a prolyl or hydroxyprolyl residue in the C-terminal position. Plays an important role in collagen metabolism because the high level of iminoacids in collagen. Defects in PEPD are a cause of prolidase deficiency (PD). Prolidase deficiency is an autosomal recessive disorder associated with iminodipeptiduria. The clinical phenotype includes skin ulcers, mental retardation, recurrent infections, and a characteristic facies. These features, however are incompletely penetrant and highly variable in both age of onset and severity. There is a tight linkage between the polymorphisms of prolidase and the myotonic dystrophy trait. Belongs to the peptidase M24B family. Eukaryotic-type prolidase subfamily. 2 isoforms of the human protein are produced by alternative splicing. 1. Serum prolidase level was significantly higher in schizophrenia patients compared to the controls.